Violets are one of the most popular blooming houseplants in existence and will provide beautiful blooms year-round when given adequate care. They adapt well to temperature, light and humidity conditions in the home but will also grow outdoors in warm climates. Maintaining the proper balance of light, water and nutrients is essential to a healthy, blooming violet plant. 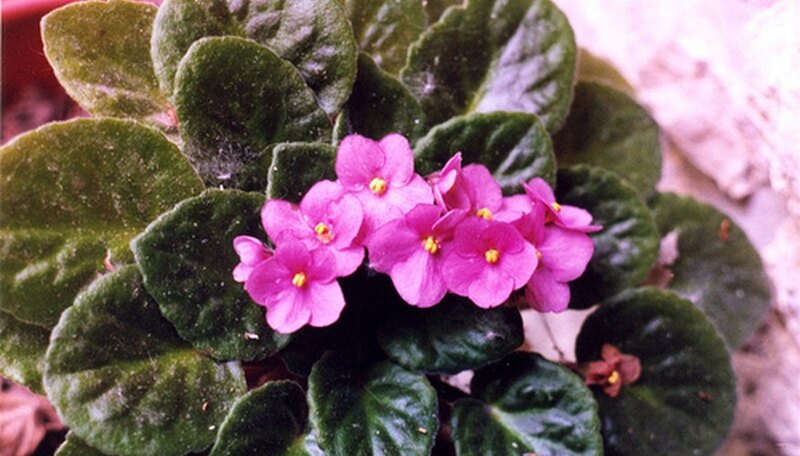 Plant violets in soil specifically formulated for the flowers, which is usually labeled as African violet potting soil. Regular garden soil and potting soil mixtures are not adequate for growing violets. You can make your own homemade version by combining one part each of soil, sphagnum peat moss and perlite. Choose a container with drainage holes in the bottom for potting violets. Fill with moist potting soil, either commercial or homemade, leaving a hole in the center for planting. Place the roots into the hole, surround them with soil, tamp down with your fingers and then water to compact the soil. Place violets in north- or east-facing windows in the summer and south- or west-facing windows in the winter. Violets require 10 to 12 hours of bright, indirect sunlight and eight hours of complete darkness per day. If these requirements are not met, the flowers will fail to bloom. Use florescent grow lights to supplement the light requirement, if necessary. Water violets from the bottom to prevent spilling on the foliage. Even a drop of water on the leaves of violets can cause disfiguring spots. Place the violet container in a deep saucer, and then fill the saucer with water. Empty any remaining water after one hour, and don't water again until the top inch of soil is dry to the touch. Keep the temperature around your violets at 65 to 70 degrees during the night, with no more than a 15-degree rise during the day. Remove violet plants from the window at night to prevent chilling. If the plant becomes too cold, it will darken and wither within 24 hours. Maintain high humidity around violets. Fill a metal or plastic tray that is large enough to hold the violet container with rocks. Add enough water to the tray to come about halfway up the rocks. Place the violet container on the rocks, where it will be exposed to the evaporating water. Apply a balanced fertilizer formulated for blooming houseplants to your violets once per year during the spring, summer or fall months. Use according to the manufacturer's instructions for proper dosage and application. Over-fertilizing can be a problem, so only apply when the foliage looks light green or the growth rate decreases significantly. Repot violets about once a year, or as they grow too large for their current containers. If the leafless part of the stem is longer than one inch, it's time to repot. Do not place violets in direct sunlight, as they will burn easily. Do not allow the soil to become completely dry at any time. Allowing the top inch to dry is sufficient before watering again. Violets like moist soil, but not too wet or dry. Watch the soil closely to make sure you're keeping up with watering.